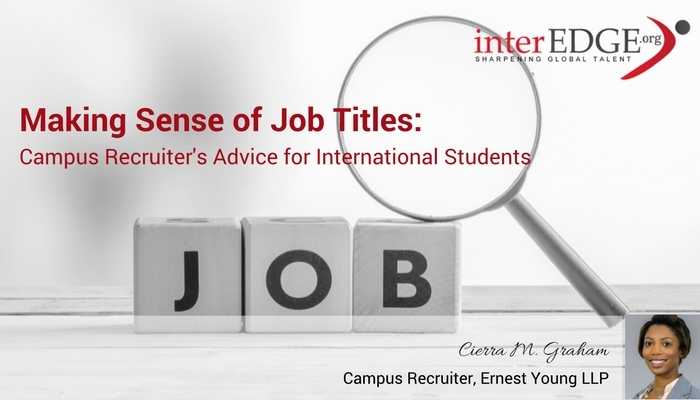 interEDGE interviewed Cierra M. Graham, campus recruiter at Ernst & Young LLP, on career advice for international students. Cierra: I recently had lunch with a candidate interested in changing her career path. I explained that, beyond the GPA and major, my hiring managers are looking for signs of individual contributions for success. I ask candidates what they specifically can bring to a position. Checking all the candidate criteria boxes can get you in the door, but the interview is for a hiring manager to get to know you and understand what sets you apart from others. Cierra: You have the same right as anyone seeking employment in the US to choose the best career path for yourself. Although job opportunities may be limited to those needing permanent work authorizations depending on their desired profession, never take a job or less compensation because you felt pressured to do so. Know your worth and have your goals in mind to approach the job market the same as anyone else. Cierra: The first error is focusing too much on the GPA and academics on your resume. Those are important to meet minimum qualifications, but academic strength does not give a hiring manager the full picture of the candidate’s qualifications. Employers are looking for leadership skills, teamwork, communication skills, and other qualities that make you stand out from others. If you never took on extra-curriculars or had a part-time job during school, then I expect you to have a high GPA because your focus has been entirely academic. In my experience, having a 4.0 GPA and no leadership or teamwork experience does not impress hiring managers as much as you think it would. The second error comes out during the interview process – describing work experience effectively. The typical US workplace has a presumed set of job titles and corresponding responsibilities. The job titles in the US do not always translate the same across countries and cultures. It is your responsibility to research and understand how to translate your prior work experience abroad on your resume before the hiring manager uncovers the reality during your interview. For example, I have had several international students interview for roles in the US and listed prior titles such as “Manager”, “Senior Analyst” and so on. When the hiring manager starts digging into those students’ actual experiences, the job duties dictate the experience level for which they will be considered. I have had “experienced Senior Engineering Analysts” possess the US equivalent of an IT Help Desk team member. Needless to say, that candidate did not receive a job offer for a Senior Engineer position because the presentation of past experience and job title did not match expectations at the interviewing US company. Cierra’s seven years of professional experience is best defined as being a specialist in talent strategy, corporate experiential education programs, and general human resource management. Her project and program experience supported the establishment of new departments, operational cost reductions, growth in brand awareness, improved retention and increases in productivity by recruiting diverse top talent. She possesses additional experience having led an established, volunteer-based non-profit organization and assists with pro bono consulting for HR and Recruiting projects. When she is not working on a professional or personal project, Cierra spends time with her husband in Dallas, Texas doing yoga, exploring new restaurants, cooking and preparing to enter parenthood. The opinions expressed are the recruiter’s own and do not necessarily reflect the views of Ernest and Young LLP.